GALION — Practice for the upcoming boys basketball season has started under third-year coach Matt Valentine. Valentine is 11-35 overall, while leading his squads to a 6-20 mark within the Mid-Ohio Athletic Conference. In the 2018-19 season, the Tigers welcome back five returning letterwinners. Three were starters from last season. Galion also lost three players to graduation. The returning starters for Galion — junior Isaiah Alsip and seniors Gage Lackey and Jack McElligott — will likely take on the same role for the team as they did a season ago. Other lettermen returning for the blue and orange are senior Tristan Williams and sophomore Carter Keinath. Alsip played his way to first-team, all-conference honors, as well as Division II honorable mention honors. Lackey tied for third in blocks in the league a season ago, averaging one block per contest and was also named to the all-conference second team. With the graduation of Colten Skaggs, Williams will get his chance to be the big man on the block for the Tigers. In addition to Skaggs, Colton Powell and Nate Eckert graduated. Also gone from the lineup due to transfer is defensive spark plug Zhamir Anderson. A newcomer to watch out for this winter is junior Stephen Thompson. Thompson, the goalie for the Galion boys soccer team, has decided to come out for the season and “gives ups that true post player that we have been lacking for years. His size, strength and ability to get up and down the floor is just the piece that we need,” his coach said. The season starts for the Tigers on Friday, Nov. 30 when they hit the road to play Bucyrus. MOAC play kicks off for Galion on Friday, Dec. 7 when they travel to Marion for a meeting with Pleasant, last season’s conference champions. File photo Galion senior Tristan Williams will be posting up on the blocks this season for the 2018-2019 edition of Tigers boys basketball. Williams will get a chance to start this season and will likely be joined by fellow seniors Gage Lackey and Jack McElligott, as well as junior Isaiah Alsip and sophomore Carter Keinath. 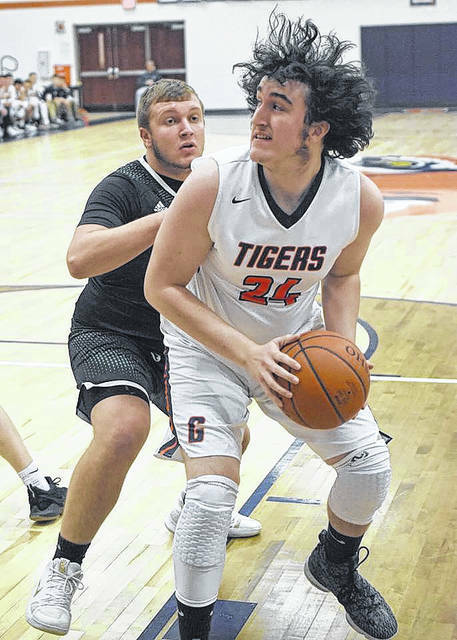 https://www.galioninquirer.com/wp-content/uploads/sites/38/2018/11/web1_Tristan-Williams.jpgFile photo Galion senior Tristan Williams will be posting up on the blocks this season for the 2018-2019 edition of Tigers boys basketball. Williams will get a chance to start this season and will likely be joined by fellow seniors Gage Lackey and Jack McElligott, as well as junior Isaiah Alsip and sophomore Carter Keinath.